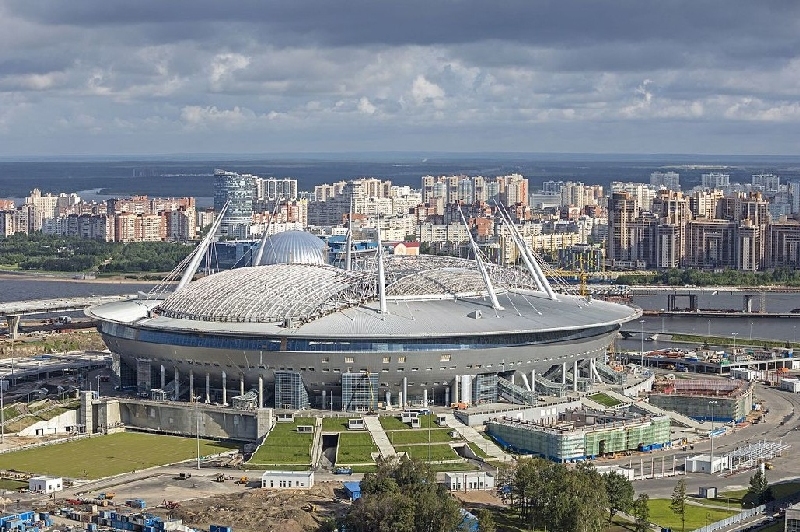 Saint Petersburg - Zenit Arena 18.06.2017: Zenit Arena, resembling a giant spaceship on the ground, will be one of the playing venues of the 2018 World Cup – the stadium, with a capacity of 69,000 seats, has been built for this particular purpose. The Petersburg Arena is now the second largest stadium in Russia, Luzhniki being the largest one. The stadium and organizers will have an opportunity to rehearse before the World Cup as Russia will be hosting the 2017 Confederations Cup. Before that, FC Zenit Saint Petersburg will have moved to their new home ground. Construction of the stadium: Construction works were begun in 2006. However, construction was delayed right from the start, first due to faulty project documentation and then due to financial issues. 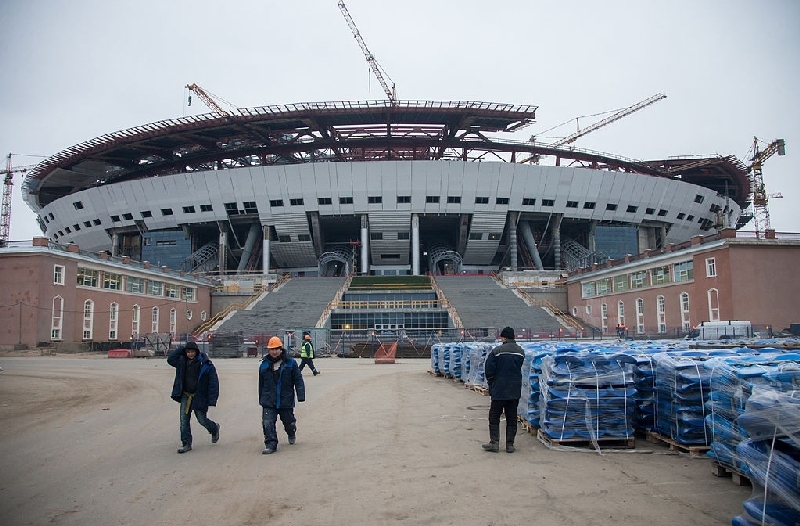 According to the original plan, the stadium, then to be called Gazprom Arena, was supposed to be completed in 2008. However, some deficiencies in project documentation were pointed out and the construction was thus delayed by a few years. Due to several delays the construction of the new stadium took an incredible time of ten years. Quite obviously, this significantly affected final costs, leading to subsequent financial issues. Funding: Originally, the new Zenit stadium should have been funded by the Russian company Gazprom, the sponsor of FC Zenit Saint Petersburg. However, Gazprom pulled out so the city of Saint Petersburg took over financing the construction. The overall construction costs went up over one billion USD, which makes Zenit Arena one of the most expensive stadiums in the world. The shape of the stadium is reminiscent of a spaceship and it was designed by Japanese architecture firm Kisho Kurokawa. A retractable roof is no exception today. The stadium is similar to Toyota Arena in Japan, which was also designed by Kurokawa. Location: The stadium is built on the site of the old Kirov stadium, which was demolished in 2006 to make room for the new arena. It is situated about seven kilometres to the north-west of the city centre, on the Krestovsky island, near the Neva river. It is about five kilometres away from Petrovsky Stadium, the former Zenit home ground.